This post is sponsored by Bing. Summer is the perfect time to travel, even if it's just to your backyard. Last weekend, we even perched our tent in my son's bedroom so that he could have a special sleep over with his sister. Since then we've had camping on the brain. Staycations are always great on the budget, and here's an idea to up the imagination on your next adventure at home. I'm delighted to share my last (how can summer possibly be coming to a close?) Endless Summer Project for this season: an upcycled camping lantern. 1. Hole punch one hole on either side of the top of the canister. 2. Cut large rectangular holes on either side. This is an easy job for an X-Acto knife, but even child scissors can cut through the cardboard cylinders with some assistance. 3. Put little hands to work on painting. 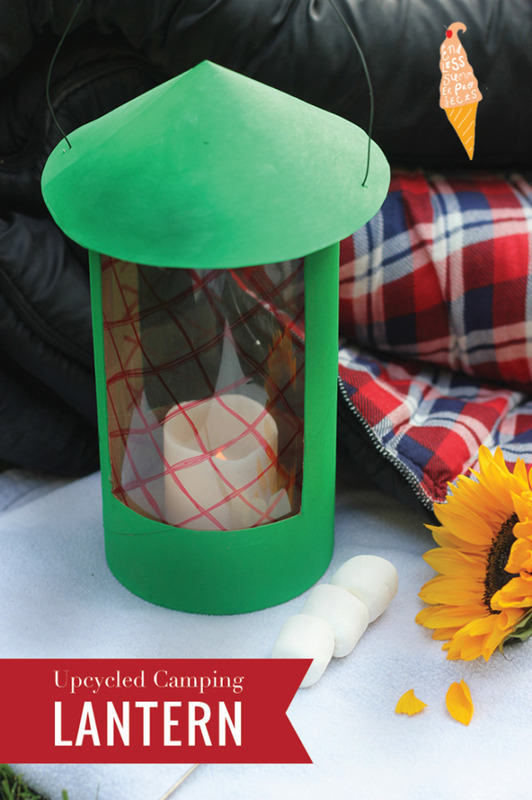 We chose campy green to make our lantern look like official camping gear. 4. Cut a large circle out of the construction paper. Cut a line into the center. Overlap and glue the excess paper to form the cone top of the lantern. 5. Cut a letter-sized transparency in half. With a permanent marker, doodle your design. Remember that the light will shine through these two panels so color to your heart's desire. Consider even making shapes to create special shadows on your tent wall. 6. Attach the transparency to the interior of the canister with invisible tape. 7. With double-sided tape or a hot glue gun, attach you candle to the bottom of the canister. *If your candle has an on/off switch at the bottom, cut out a small hole to reach the switch before gluing into place. 7. String wire or rope through the holes punched on the canister and through the cone roof. The warmth of the candlelight makes a charmed evening feel like one of the best of childhood. The kids are excited to use theirs inside and outside. We haven't yet done an overnight in the tent (outside), but these upcycled camping lanterns might be the inspiration we need to stay brave in the dark. Here's to the last glorious weeks of summer, friends! Have you seen these floating around the interwebs, friends? Great big, beautiful lists of simple, fun, wonderful summer activities that make you wish you were seven again. Well, maybe this summer we will be. My fam has joined in the fun, too. In the past, we've made our lists over dinner conversations as the school year waned to a close. This year we again had such conversations and now we're writing them down and posting them pretty for all to see. My job commitments grow more extensive in the summer so I have to be sure to keep these kinds of lists front and center so that I and the rest of the happy inhabitants in our home can have a carefree summer. And you just have to read this inspired post over at Hands Free Mama. Here's our list. 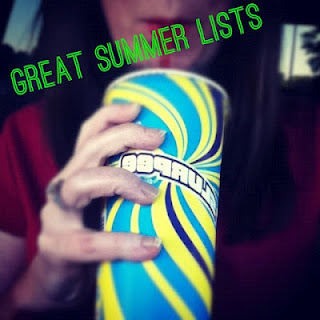 Please feel welcome to pin or download and make it your own great summer list. I have my own summer list that I'll share with you next week as we move into the Summer Edition of Pars Caeli. Have a great weekend, friends. We'll be kicking it at home, knocking off some of these moments like hanging out by the pool and tie dying summer shirts. See you back here on Monday! Thanks for a great week...it's so lovely to have you over. PS. If you enjoy a good photo party, follow me and many others by using the hashtag #instacamp (Chookooloonks offers a new prompt each Monday) and #100summerdays (run through MomAdvice.com). It's super fun to see all the great summertimes captured on Instagram and shared through Twitter. PPS. I made the above image (with the Slurpee) in Phonto. It's a quirky photo app with tons of great fonts that you can add to your images. Check it out.